Foodies will enjoy scenes of making an honest-to-goodness onsen tamago (eggs soft-boiled in hot spring water) and okonomiyaki. 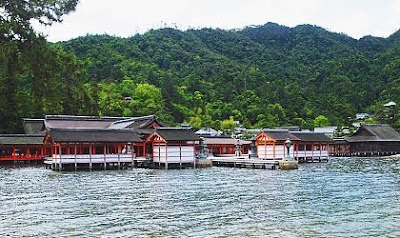 This penultimate segment opens with a Shinto procession through Miyazu, followed by views of Amanohashidate, the "singing" sand of Kotobikihama, and the hot spring resort town of Kinosaki. And on Miyajima, we see the world-famous Itsukushima (above), which sits on stilts to avoid touching the surface of the holy island.